Discussions Magazine Music Blog: MUNGO JERRY: THE DAWN ALBUMS COLLECTION (5CDs) reviewed! MUNGO JERRY: THE DAWN ALBUMS COLLECTION (5CDs) reviewed! In the U.S., Mungo Jerry is known for being a one-hit wonder… and what a wonderful hit it was! “In The Summertime” was a massive hit in 1970 and is still played on the radio and used in TV shows, movies and adverts. Most Americans would be forgiven if they thought that “In The Summertime” was the only track that the band ever released. MUNGO JERRY: THE DAWN ALBUMS COLLECTION, 7Ts/Cherry Red’s five CD box set is here to prove them wrong… and hopefully, it will turn them into Mungomania believers! ELECTRONICALLY TESTED followed in 1971. Their best-selling album, this is where “In The Summertime” finally found a home. The album introduces a harder edge with more electric guitar but the party atmosphere is still present and accounted for. Some pop melodies start entering the fray but for the most part, the hooks are still Blues-based and certainly infectious. Oddly enough, the nine-minute heavy Blues rocker “I Just Wanna Make Love To You” is the second track on the album, which slows it down a bit. “…Summertime” comes immediately afterwards and picks things back up again. The rocking “Baby Jump” was a huge hit for the band, reaching #1 in the UK. “Memoirs Of A Stockbroker,” “Somebody Stole My Wife,” and “She Rowed” are more album highlights. The six bonus tracks include the excellent hit single “Lady Rose." YOU DON’T HAVE TO BE IN THE ARMY, released later in 1971, continues the jugband/skiffle party vibe without losing any steam. While the basic formula of “… Summertime” was present and accounted for, Ray and the Mungos weren’t in the habit of rehashing that big hit. Again, the songs are certainly Blues-based but so infectious that it was difficult to label them merely a one-trick pony. “Give Me Love” is unhinged Boogie that could have fit on a Status Quo album. “Northcote Arms” recalls Chuck Berry’s “Johnny B. Goode.” “Simple Things” is jaunty and melodic. “On A Sunday” does possess a hint of “… Summertime” but is so charming that you don’t notice after the first 45 seconds or so. The CD includes four bonus tracks. Something happened in 1972 that changed the course of the band’s history. Mungo Jerry, the band, decided to oust vocalist/songwriter Ray Dorset and continue under the Mungo Jerry name. Label and management put an end to that idea and Ray Dorset BECAME Mungo Jerry (performer) and brought in a whole new cast of musicians. BOOT POWER (1972) was Mungo Jerry’s first album after the failed mutiny and it ROCKS! “Going Down The Dusty Road” was the only song on the album that resembled the Mungo Jerry of old (you know, the jugband period that ended at the end of ’71). Dorset’s confidence as a songwriter was obvious: these songs were catchy, focused and full of heart and soul. Dorset’s unique voice was still recognizable but this new Mungo Jerry was a proper Pop/Rock band. OK, maybe they were a bit too eccentric to be a polished Pop outfit but that doesn’t mean they couldn’t write catchy tunes. “46 And On,” “Lookin’ For My Girl,” “My Girl And Me” and “Sweet Mary Jane” are pure delights. Four albums in and this proved to be their most consistent full length. It may have sounded like a different Mungo Jerry… but that is because it was. A different chemistry and a more singular focus meant that the band were moving forward. The CD features four bonus tracks. Two years later, LONG LEGGED WOMAN found the band losing the focus they displayed on BOOT POWER and trying to mix their new sound with classic jugband-period Mungo Jerry. “Wild Love” is a quirky rocker that features a smidgen of Sweet influence. “Summer’s Gone” is a blatant rewrite of “In The Summertime” right down to the double tracked vocals and musical arrangement. “Don’t Stop” is a Bob Seger-like rocker… if Seger had a sense of humor. For the most part, the album consists of eccentric rockers that are still uniquely Mungonian but most likely influenced by bands like T. Rex, Status Quo and other Glam and Boogie outfits. Far from a bad album, this platter doesn’t live up to the promise of their previous album. Includes four bonus tracks including ‘Say Goodbye,” the final song of the set. 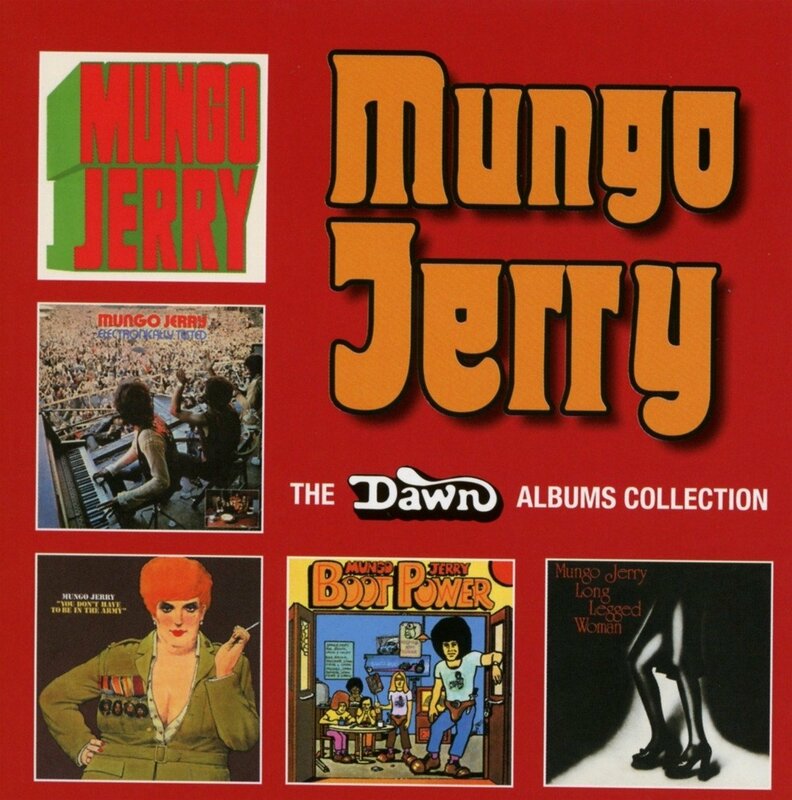 THE DAWN ALBUMS COLLECTION is proof that Mungo Jerry was – and is – more than just “In The Summertime”. For a good time, call 1-800-MUNGOMANIA. Better yet, give this a spin. Remember to bring a six pack, a spliff and your dancin’ shoes!